The interface should require neither the client application nor the parser implementation to keep the full document content in memory or spooled to disk. This allows even huge documents to be parsed without excessive resource requirements. A parser implementation should be able to include structural information (headings, links, etc.) in the extracted content. A client application can use this information for example to better judge the relevance of different parts of the parsed document. A client application should be able to include metadata like the file name or declared content type with the document to be parsed. The parser implementation can use this information to better guide the parsing process. A parser implementation should be able to return document metadata in addition to document content. Many document formats contain metadata like the name of the author that may be useful to client applications. While the default settings and behaviour of Tika parsers should work well for most use cases, there are still situations where more fine-grained control over the parsing process is desirable. It should be easy to inject such context-specific information to the parsing process without breaking the layers of abstraction. These criteria are reflected in the arguments of the parse method. The first argument is an InputStream for reading the document to be parsed. If this document stream can not be read, then parsing stops and the thrown IOException is passed up to the client application. If the stream can be read but not parsed (for example if the document is corrupted), then the parser throws a TikaException. Some document formats like the OLE2 Compound Document Format used by Microsoft Office are best parsed as random access files. In such cases the content of the input stream is automatically spooled to a temporary file that gets removed once parsed. A future version of Tika may make it possible to avoid this extra file if the input document is already a file in the local file system. See TIKA-153 for the status of this feature request. The parsed content of the document stream is returned to the client application as a sequence of XHTML SAX events. XHTML is used to express structured content of the document and SAX events enable streamed processing. Note that the XHTML format is used here only to convey structural information, not to render the documents for browsing! The XHTML SAX events produced by the parser implementation are sent to a ContentHandler instance given to the parse method. If this the content handler fails to process an event, then parsing stops and the thrown SAXException is passed up to the client application. Parser implementations typically use the XHTMLContentHandler utility class to generate the XHTML output. Dealing with the raw SAX events can be a bit complex, so Apache Tika comes with a number of utility classes that can be used to process and convert the event stream to other representations. The third argument to the parse method is used to pass document metadata both in and out of the parser. Document metadata is expressed as an Metadata object. The name of the file or resource that contains the document. A client application can set this property to allow the parser to use file name heuristics to determine the format of the document. The parser implementation may set this property if the file format contains the canonical name of the file (for example the Gzip format has a slot for the file name). The declared content type of the document. A client application can set this property based on for example a HTTP Content-Type header. The declared content type may help the parser to correctly interpret the document. The parser implementation sets this property to the content type according to which the document was parsed. The parser implementation sets this property if the document format contains an explicit title field. The name of the author of the document. The parser implementation sets this property if the document format contains an explicit author field. Note that metadata handling is still being discussed by the Tika development team, and it is likely that there will be some (backwards incompatible) changes in metadata handling before Tika 1.0. The final argument to the parse method is used to inject context-specific information to the parsing process. This is useful for example when dealing with locale-specific date and number formats in Microsoft Excel spreadsheets. Another important use of the parse context is passing in the delegate parser instance to be used by two-phase parsers like the PackageParser subclasses. Some parser classes allow customization of the parsing process through strategy objects in the parse context. Apache Tika comes with a number of parser classes for parsing various document formats. You can also extend Tika with your own parsers, and of course any contributions to Tika are warmly welcome. The goal of Tika is to reuse existing parser libraries like PDFBox or Apache POI as much as possible, and so most of the parser classes in Tika are adapters to such external libraries. Tika also contains some general purpose parser implementations that are not targeted at any specific document formats. The most notable of these is the AutoDetectParser class that encapsulates all Tika functionality into a single parser that can handle any types of documents. This parser will automatically determine the type of the incoming document based on various heuristics and will then parse the document accordingly. 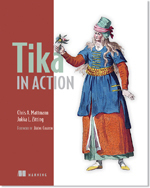 For more examples of calling Parsing with Apache Tika, please take a look at the Tika Examples page.